Ross Couty manager Jim McIntyre described the loan signing of David Goodwillie from Aberdeen as a "no-brainer". 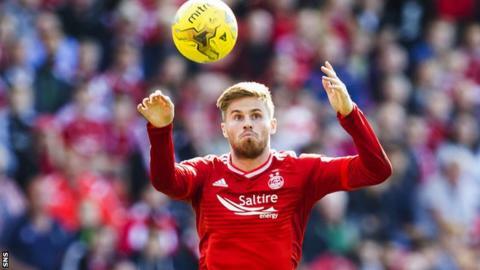 Goodwillie was allowed to leave Pittodrie on loan until the end of the season after Derek McInnes recruited Wales striker Simon Church. McIntyre believes the former Scotland cap is a great fit for his side. "He's a player I know well," McIntyre said. "He was a young boy at Dundee United when I was a player there." McIntyre believes County's style of football will play to Goodwillie's strengths. "He's got goals in him. I think he's improved his all round game as he's got older. He's got great strength, good awareness and I think the way we play will suit him. "There's no doubt I think a partner, playing beside someone, I think his game suits that. "When we found David was going to be available then it was a no brainer. To attract somebody like David is a fantastic bit of business for us." Goodwille is not ruling out a permanent move to Dingwall but believes he has to demonstrate his ability and earn the opportunity. "If I can do well here I can have that option of maybe staying a wee bit more permanent," he said. "I can't expect it; I need to do well to deserve it. "I watched them progress over the last couple of years and under Jim McIntyre they've been great to watch. It's attacking football and I want to get involved in that. "I just hope to show how good I can be for Ross County and help them progress up the league like I think they will. McIntyre's desire to add to his strike-force was heightened by recent injuries to first-choice pairing Craig Curran and top-scorer Liam Boyce. Boyce did make a substitute appearance in the 3-1 League Cup semi-final win over Celtic but the manager admits he's unclear when Curran will be ready for a return to action. "Obviously lately with Liam Boyce and Craig Curran suffering from injury, then we were a wee bit light," said McIntyre. "Craig is still struggling a wee bit in terms of trying to build up his immune system. "We just felt that could be an ongoing process for the next month or so. Bringing Goodwillie here was the right thing to do." Goodwillie is cup tied in both the League and Scottish Cup competitions so will miss the League Cup final next month and Saturday's match against Linlithgow Rose.